There were 2 comments in my moderator queue this morning and the first was obviously spam, but the second was less obvious. Click on the image to the left to see what it looked like. You’ll notice the post that the comment was submitted to. A keyword in the name space. And finally, a nice but generic comment. This comment has every intention of staying on my blog where it can link back to Mr. Forex Robot for ever. Next step, I googled the entire comment (in quotation marks) to see if it has shown up elsewhere. You can click on the image to the right to see part of the first page. Notice the exact text showing up in almost all these blogs. There are a few entries where the text doesn’t show up in the search results, but if you click through to those entries you’ll find our little friend there in the comments. This example was found on a blog about high blood pressure amongst the elderly. Looking at this comment showing up in the wild, we can see it coming from the same spammer, using the same keyword for a name and linking back to the same url. Needless to say, this comment was deleted permanently. Bye-bye forex robot. Alas that I ever knew ya. So, a little vigilance and we’ve avoided populating the web with meaningless drivel that is only intended to improve someone’s bottom line. Leave the room and link juice for those who earn it with real, personal comments that are part of the conversation. And a note to Mr. Forex Robot — why not send the real Mr. Forex over for a visit and some real conversation. We’d love it if the real you showed up. I’ve added a new post to this series on battling comment spam. Read Battling Comment Spam — The Big Guns to see what we can learn from the A-List bloggers. Now you may think that this too is a spam comment because of the Keywords in the title..But it is infact not!! I am just trying to appreciate your efforts that you are bringing this grave issue of Comment Spamming infront of the people with your own touch..Good going buddy..
Hey Love Tales. Thanks for taking the time to share! As you can see, you’ve only triggered 1 of the 3 tell tale signs since you do have a Gravatar image and your comment is anything but generic. That is why you need to check the 3 signs and use judgment before declaring something as spam. I’ve started to experiment with KeywordLuv on one of my blogs and I’ll probably end up adding it to all of them at some point. Then you’ll be able to use your name and keywords — although Love Tales isn’t bad to use as a brand! I too get the occasional comment that is iffy- I’ve never thought to google them though. I generally just check out the website they give a link to, and go from there. ALso (and I hate to say it) pretty much every comment I have ever gotten giving an “.ru” email address has been spam. The .ru seems to be one of the havens of spammers. I find that it is interesting to see how often the same comment gets used around the web. Some of them are pretty well traveled. generally nowadays whenever the 'Name' is not a person's name… it reads "spam" in my mind right away. Thank you for the post. Has made me rethink this topic in greater detail. That’s why the lack of a gravatar is only an indicator, not proof. I always look at the name, comment and sometimes the email address and site to get a feel for whether someone is real or not. If there is a generic comment that doesn’t show that they’ve actually read the post then you have a decision to make — do you leave the comment and possibly provide link juice for a spammer or do you delete one that could possibly be someone who really appreciated what you wrote? Each blogger will have to decide that themselves. Thanks for joining in the conversation. It’s always great to chat with another Bill! Of course my blog (running on self hosted WordPress) has been hit with spammers and Askimet does a great job. I guess the way I am thinking is that a blog with lots of those links looks like a dead site and there is no community group keeping the neighborhood straight. I think leaving spam comments on a blog makes it look cheap. A lot of the ones that are on the Internet and filled with spam are most likely dead blogs or fake blogs just to get value from the linking potential, of course over time they are identified as link farms and that is not where you want a link back to your site. This has raised a question and maybe someone knows. 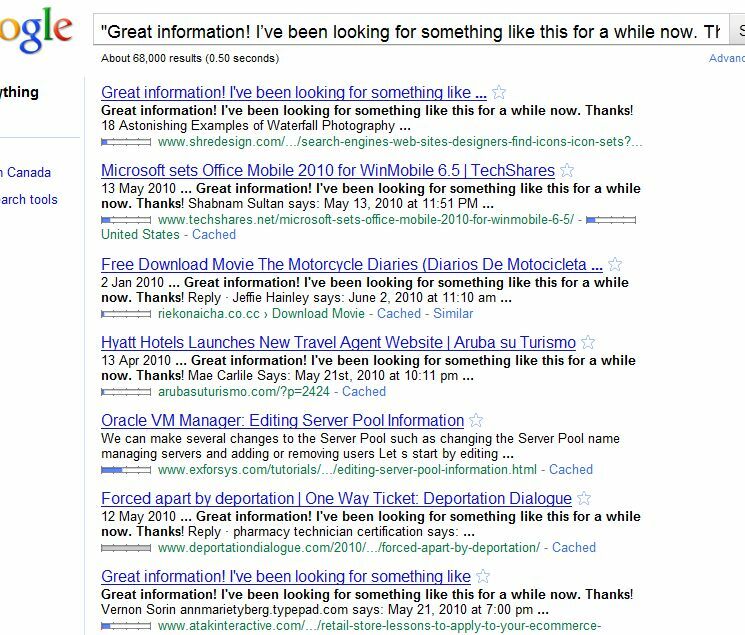 Of course a good way to get a better standing with Google is to get comments on your blog and appear popular. So you could take a spam comment that has been logged with an IP address. Then you just edit that comment and kill the active link if you want to. Of course a lot of comment boxes are “nofollow” so you would not give any link juice away. I just looked and I see that you have the “follow” on your comments. I appreciate that, I have my blog set up that way and just delete the “losers”. Back to the point, I wonder if you edit the comment will the IP address and the value be attributed to you? Or if you have an IP address that has been flagged can that hurt your popularity? Never heard this talked about. Any ideas? Still get that funny feeling when talking to another Bill, does it ever go away? You raised a great question. I’m not sure how Google or other search engines would treat that. However, I would shy away from it myself. It wouldn’t be much better than making up comments yourself. 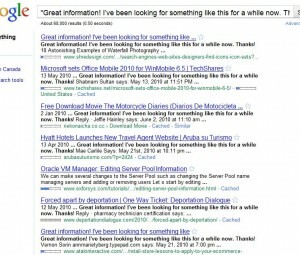 Google shouldn’t see any IP addresses since they aren’t shown on the public face of your blog (and Google shouldn’t be in the admin), but they may sense something fishy when the same comment suddenly has different links, etc. It would be interesting to know the answer. Hey, try installing some captcha or other bot-checker application on the comment section to stop the online bots or spammers. Hi Date Australia. You triggered 2 of my spam criteria with having a keyword for a name and no gravatar. But your comment was actually relevant to the post, so I’m assuming that you did actually read it. But if you check out the previous posts in the series, you’ll see why I abhor captcha and other “prove you’re a human” code for blog comments. They do have their place, but I don’t think the comment section of a small blog is one. I too have been battling with comment spams and some are even blatant obscene ones that doesn’t have a mind of its own. Worse than an idiot for not reading what the post was all about and just simply leaving a comment. Annoying at times, really. It can be frustrating — I’m always amazed at the the spam that shows up. You can read the other 3 posts in this series starting at http://blogs.wcnickerson.ca/wo.....ment-spam/ to get some idea of what I do to handle it on my blogs. What I find interesting is the link that you’ve provided doesn’t actually go to a blog, but to a squeeze page. And none of the links on the sidebar go where they say they will. It makes me wonder where you’re getting spam comments from, and also makes you look a little bit spammy too. I actually have a blog linked to that landing page. I had it attached to the website field above. Sorry if it may look a bit spammy but trust me, it’s not. Thanks for accepting my comment and a great blog you have here. Thanks for checking back Amanda — it shows that your comments are legitimate. I figured they were but the squeeze page kind of threw me a bit. I’m glad to see that my initial instincts were right. Thanks for accepting my comment. Well, I’m actually planning to revamp that squeeze page anyway. I’m thinking about deleting all of it or maybe switching them to WordPress if time permits. I just haven’t figured out when. There is software around that searches for Dofollow blogs and then places general sounding comments on them. I didn’t find out about it until I got a comment that sounded legit but later saw that it came from someone running this software. I did the same thing as you and googled the main phrase and turned up over 500 search results all leading to comments saying the exact same thing. The software that spammers use is getting more and more sophisticated. I’ve actually seen comments that use parts of the blog post or other comments and ‘spin’ them as the comment text to make them more like real comments. It’s hard to detect the spam comments sometimes.